I hope you will forgive me if I go a little off-topic here, but a girl’s gotta have a cause, after all! 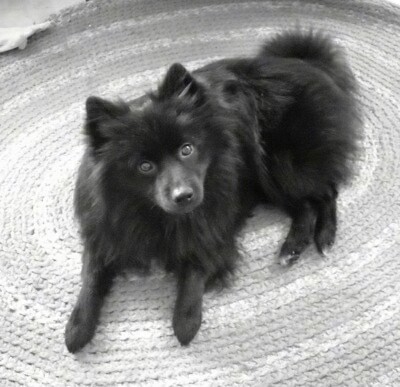 Imagine you are an 8-pound little black dog that looks something like this guy . Your toenails are perfectly groomed, you are in great shape, you love people, and you clearly love being smack-dab in the middle of a loving home. Hard to know what it is that went wrong. Maybe you were exploring a little too far out and lost your way. Maybe you were camping with your family at the beach and you got separated. Etc, etc. But, now it’s about 100 degrees outside and you’ve got to keep moving. Find your people. So, you follow them. And they see you and they want to get you and help you, but their hands are full, and you don’t want to be caught, you want to go back to your peeps. So, you keep your distance. Then, you roam around a nearby neighborhood until someone drives up at dusk and nearly runs you over. When she gets out of the car, you are naturally wary. This person just nearly hit me with her car. What does she want? But, maybe she can help and you are terribly thirsty by now. So, finally with the help of some VERY tasty cheese, she convinces you that she ISN’T the devil after all. And she brings you in and gives you water. Ahhhhh……THANK YOU. Now, let’s go out and find my peeps, shall we? But, it doesn’t go that way. You don’t go anywhere. This person feeds you, and that’s nice, but you are really not hungry because you ate awhile ago. You check out the other dogs that live with this newly-found devil-turned-friend(?) and they seem pretty cool. You see her making bunches of calls, typing on a keyboard, fetching food, setting up a crate with fresh blankets, but she is NOT getting the point. We need to go find my peeps, dontcha know? You are getting a bit stressed, but you are not in danger, not in the heat, and getting oh, so tired. You start to drift, you are falling asleep, but you keep catching yourself awake. You have a job to do. Go find your peeps. Oh, but ….so sleeeeeeeepy. So, she comes and gets you…takes you out. Feeds you breakfast and then….whoosh! You are in the car! “NOW, we are making some progress, you think!” We are GOING somewhere. I will see my family today. You take a stop at an office that smells A LOT like other animals. Ooooh the smells, and people cuddling and cooing over you. They run a crazy machine over you, it seems a bit scary, but doesn’t hurt a bit. Scenario number one: The person who brought you to this smelly place gets a BIG FAT GRIN on her face! She pulls out her phone. She swoops you up and puts you in the car, sets the GPS, and in fifteen minutes you are welcomed home by your peeps that you lost so many hours ago. You completely forget about the devil-turned-friend. You are HOME! Scenario number two: After the scary wand, you are back in the car. YAY! you are on your way….wait…back to HER house? WRONG HOUSE you cry! And she starts up this ridiculous phone call, typing thing, while you sit by and try to mind-meld your deepest wishes into her brain. (With an adorable gaze). The next couple of days are a bit of a blur. You are hanging with new dogs, eating new food, meeting new people, and In General, not at home with your family who knows what it means when you turn your head that way, whine at the right time, paw their knee. This person is clearly STUPID and does not understand the obvious language you have developed with other peeps who respond correctly every time. Your rhythm is off. You pant a lot. You’re getting a bit concerned that no one has your idea in mind. You just know that you are where you are. On an adventure you never imagined. You trusted your peeps and they must be as desperate as you are to find them. “Oh, geez, it looks like we are going in the wrong direction AGAIN!” you think.